Maurus Reinkowski is a Professor of Islamic and Middle Eastern Studies at the Department of Social Sciences, University of Basel, Switzerland. His field of specialization is the history of the late Ottoman Empire and the modern Middle East. Amongst other subjects, he has published on the early beginnings of the Israel-Palestine conflict, nationalism, and minorities in the Middle East, imperial order, conversio,n and crypto-religiosity as well as the history and practice of Islamic studies in German-speaking countries. Recent major publications in English include Helpless Imperialist:. Imperial Failure, Fear and Radicalization, edited jointly with Gregor Thum (Vandenhoeck & Ruprecht, 2013) and World War I and the End of the Ottomans: From the Balkan Wars to the Ar­me­ni­an Genocide, edited by Hans-Lukas Kieser et al. (I. B. Tauris, 2015). 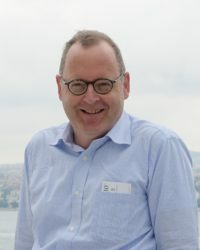 Together with Michael Butter he has co-edited Conspiracy Theories in the United States and the Middle East: A Comparative Approach (De Gruyter, 2014). Another publication on the question of conspiracy theories in the Middle East is his contribution “Zionism, Palestine and the Ottoman Empire: A Case Study on Con­spiracy Theories in the Middle East” in Juda­ism, Christianity, and Islam in the Course of History: Exchange and Conflicts, edited by Lothar Gall and Dietmar Willoweit, De Gruyter, 2016, pp. 93–104.